← The social origins of human thinking. 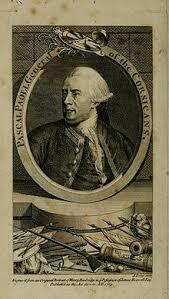 The Scottish lawyer and writer James Boswell (1740-1795), famous for his Life of Samuel Johnson, was also a great supporter of Pasquale Paoli and Corsican independence. Boswell met enlightenment thinkers such as Voltaire and Rousseau and was encouraged by Rousseau to visit Corsica where political developments and its struggle for independence from Genoa briefly put the island at the centre of enlightenment political ideas. In Corsica, Boswell was deeply impressed by the qualities of the Corsican leader, general Paoli, whom he spent a week with in the village of Sollacaro. On his return, he campaigned in the British press, lobbied prime-minister William Pitt the Elder to intervene and also personally sent money and cannon from Scotland to the Corsican army. 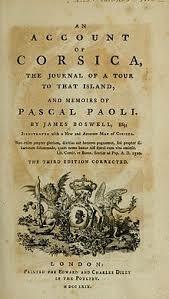 The key element of Boswell’s campaign was his An Account of Corsica, The Journal of a Tour to That Island; and Memoirs of Pascal Paoli (1768) which was both a historical, political, socio-economic and cultural overview of the island and a journal of his tour to visit Paoli in 1765. Boswell draws on his diaries to paint a picture of the primitive and democratic simplicity of the Corsican people and the heroism of their leader. The Account was published in Glasgow in 1768 and sold well, reaching a third edition within the year. It also ran to three Irish editions and was translated into German, Italian, Dutch and French. After having travelled around Germany, Switzerland and Italy for a year, Boswell decided to go to Corsica in the autumn of 1765. The island was at the time the scene of sporadic skirmishes between occupying forces from Genoa and France on one side and a Corsican independence movement led by general Pasquale Paoli on the other. 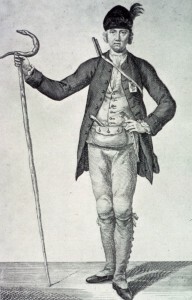 Boswell gained passage from Italy to Corsica on an English ship, and accompanied only by his manservant, travelled to the interior of the island and the stronghold of the rebel forces. Here he met and befriended the rebel general Paoli and took extensive notes of his visit, before returning to the European mainland. In 1768 Boswell published his account of the visit and of his meeting with Paoli, who had by then gone into exile in London and remained a lifelong friend. Boswell wanted to shape public opinion and persuade the British government to support the Corsicans in their struggle for independence. His English readers knew little about the island but were eager to be thrilled by exotic travel journals. The first part of the Account aims to set the context for the account of his personal journey and meeting with Paoli. The text reveals the young Boswell as a serious enlightenment polemicist, albeit one with a tendency to idealise both Paoli and the Corsican people. Some of this may have been intended to counter any preconceptions his readers might have about the Corsicans as wild, savage, brigands. For Boswell, Corsican independence was something of an obsession and his friend Samuel Johnson was once driven to implore him to “empty your head of Corsica, which I think has filled it for rather too long.” Boswell was undoubtedly deeply committed to the cause of Corsican independence and Paoli as its embodiment, but there is also more than a hint of the hero-worship which he later transferred to Dr. Johnson. Nevertheless, The Account is an important contribution to campaigning and travel writing and what Boswell and Paoli argued for in the late 18th century is still a matter of live political debate, both in Corsica and in metropolitan France. The struggles of this small embryonic democratic state were representative of a global emancipation movement whose project has arguably not yet been fully achieved over 200 years later. 23 years before the Life of Johnson the Account secured Boswell’s fame and he was often referred to as ‘Corsica’ Boswell. This entry was posted in History and tagged Corsica, Democracy, enlightenment, Equality, James Boswell, Pasquale Paoli, Samuel Johnson. Bookmark the permalink.